Orlando, Florida – July 21, 2009 – Kitty Code, LLC announced the availability of Hurricane 3.0, a hurricane and tropical storm tracker for the iPhone and iPod Touch, in the iTunes App Store. Hurricane, the most popular and best selling hurricane tracker for the iPhone and iPod Touch, returns with a great update for the 2009 hurricane season. “Hurricane 3.0 will bring information to those in a storm’s path when they need it the most by providing the most comprehensive tropical data available on a mobile device”, said Ilene Jones, Co-Founder and CEO of Kitty Code, LLC. 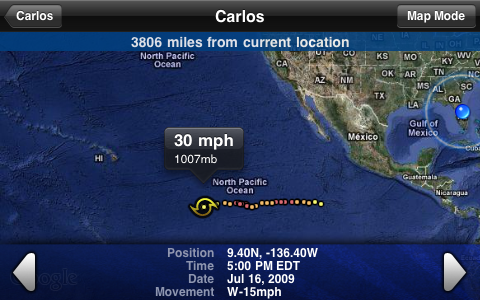 Hurricane 3.0 for iPhone is only $3.99 (USD) and available exclusively through Apple’s App Store. More information about Hurricane for the iPhone and iPod Touch can be found at the official Hurricane website. Kitty Code, LLC is a privately owned startup in Orlando, FL, which writes innovative applications for hand held devices. With over 30 combined years of experience in weather, web technologies and game development we are able to create games and applications which are robust, fun to play, technically savvy and yet easy to use. To find out more about Kitty Code, join us on our website. Copyright 2009 Kitty Code, LLC. All Rights Reserved. Apple, the Apple logo, iPhone and iPod are registered trademarks of Apple Computer Inc. in the U.S. and/or other countries.